PROS: The EZ220 is inexpensive, gives a good amount of amplification, and has good battery life. CONS: Not a lot of sound customization. Volume switch could be improved. SUMMARY: If you can’t afford a hearing aid and are instead doing without, the EZ220 may be a device that will help you. It offers proper amplification and some amount of customization, but it doesn’t have all of the bells and whistles of the higher priced personal sound amplifiers. The low cost makes it an attractive option to most people so if you just want a bit of amplification. 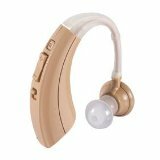 If you are looking for a reasonable quality budget hearing amplifier, the Easy US Life EZ220 is a great option. Much more useful than the $20 or $30 drug store amplifiers, the EZ220 provides a nice fit and a good level of amplification, all for a reasonable price. This device is designed for anyone who needs the sounds around them to be amplified. It could mean when watching TV, having a conversation with someone soft spoken, anyone who has trouble hearing in a lecture or a meeting. The EZ220 doesn’t offer the same level of sound customization that some of the higher end personal sound amplifiers do. It can, however, be a useful device for anyone who has lost a hearing aid and is waiting for a replacement, someone who is unable to afford a professional hearing aid and is currently using nothing, or someone who just needs a little bit of help hearing in certain situations. As with any hearing device that you put in your ear, you will need to give it a few days to allow your brain to adjust to the amplification. For the price, this model is fairly comfortable, although slightly bulky and a bit heavy compared to some of the higher end hearing amplifiers. 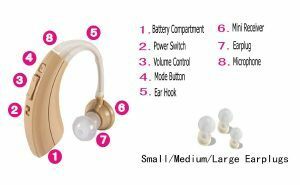 The unit comes with three different sizes of ear pieces, so you have a bit of room to customize the fit. The ear hook coming from body of the unit into the earpiece is pretty big and not discreet at all, so if you are conscious about wearing a device in public, this isn’t a good choice. People will know that you are wearing a hearing device. The earplug that you place into the ear canal is also quite large, and sometimes this type of design where the ear canal is blocked completely can lead to ‘itchy ears,’ that is something that happens with some hearing devices. For a budget model, the quality of the sound is pretty good. It is a device that a lot of people would find useful for watching TV, having trouble hearing soft-spoken people or just generally using it in quiet environments. Since it is an amplifier, it does precisely what an amplifier does, amplifies everything. If there is a lot of background noise, then it will also increase that type of sound. You aren’t going to want to wear this in a restaurant. If you turn the volume up too high, you may hear a sort of white noise static, but you can get rid of that by reducing the volume. Obviously, for the low price you aren’t getting the highest level of parts or components but for what it is, the sound quality isn’t bad. If you are looking for a high level of customization and great sound quality, several higher priced products are a good alternative. See our comparison charts on Best Behind the Ear Amplifier or Blue Tooth Enabled amplifiers. There is no specific warranty on this product. 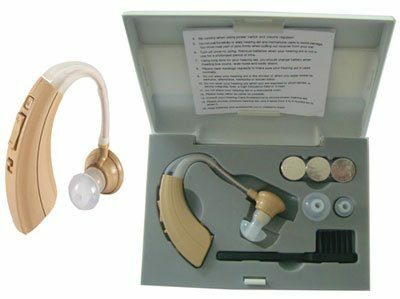 The company website says “At our discretion, we will either refund or replace any broken or defective item.” If you are unsure about this product, you may want to have a look at The Empower or the Tweak Hearing device that offer a 30 money back guarantee along with a 6-month warranty. Not much support available for this amplifier, however, it is possible to contact the company through their website. Most low-end hearing amplifiers don’t have much in the way of sound customization. With the device +/- switch for raising and lowering the volume, although a number reviews have complained that the lowest volume on this device is still too loud, or the highest isn’t loud enough, or it doesn’t change at all. If you can get the volume set correctly, then the sound is pretty good once you have given it a few days to allow your ears and your brain to adjust to the amplification. Most hearing amplifiers either don’t have an on/off switch or have to be taken out of the ear to reach the switch. This model allows you to turn it off and on while it is still in their ear. The unit also has a button to switch channels to one of 15 different high or low-frequency channels, although we couldn’t notice much of a difference in the channels. If you can’t afford a hearing aid and are instead doing without, the EZ220 may be a device that will help you. It offers some amplification and some amount of customization, but it doesn’t have all of the bells and whistles of the higher priced personal sound amplifiers. The low cost makes it an attractive option to most people so if you just want a bit of amplification. 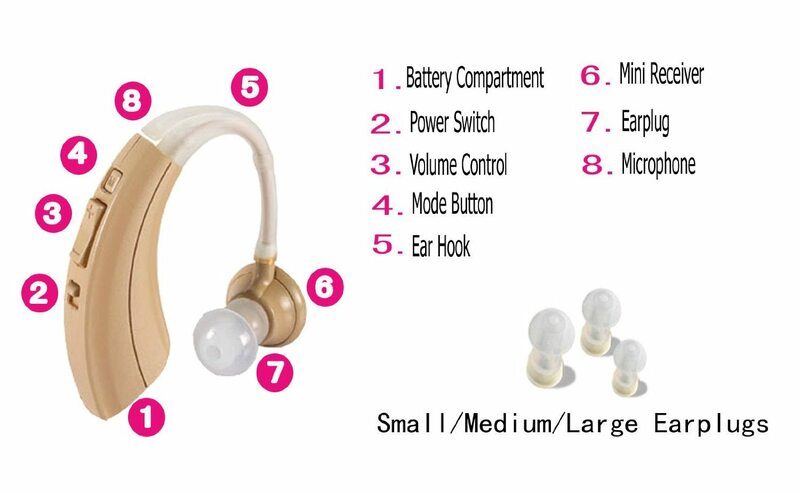 The unit can be worn in either ear, and it has a long-lasting battery with replacement batteries being very cheap. If you are experiencing hearing loss, it is best to seek professional help to determine your best options. If you or a loved one are unwilling or unable to do that, then it is worth looking at low-cost hearing amplifiers to see if they can make a difference to your quality of life. Volume switch could be improved. Hearing Amplifiers Hub is a participant in the Amazon Services LLC Associates Program, an affiliate advertising program designed to provide a means for sites to earn advertising fees by advertising and linking to amazon.com.